Bring on the love for Golf like never before in the spaces you call your own. Declare the love for the game in the simplest words yet with an impact that is powerful and rather captivating in its imagery. Here is a simple and very evocative little sign board that help you express the deepest of your love – in this case for the game you love to play. 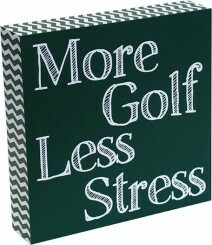 Be the first to review “More Golf Sign” Click here to cancel reply.